Creamy oil is a traditional product on our tables. Oil is valuable if it is natural, without additives, flavourings and vegetable fats. Unfortunately, the butter oil is a rarity in stores. But it is useful not only for healthy people, but patients. 15-20 grams of butter, which will provide our body a third of the daily dose of vitamin A. in addition, the oil contains vitamins E, D and K, essential for vision and bone growth, healthy skin and hair. How to identify genuine butter oil? And how to choose it in the store? On the package is always specified the type of butter: "Butter", "Amateur" or "Peasant". Traditional creamy butter has a fat content of 82.5% as "Amateur" - 78%, "Peasant" is 72.5%. If you specify a fat content of below 70% - before you spread. The composition of butter must not include vegetable fats. Quality product only consists of natural cream and whole milk. The presence of palm, peanut, coconut oil or so-called "milk fat substitute" must be accompanied by the words "Margarine" on the package. The oil from natural cream in winter is white. But the summer cream butter has a lovely yellow tint that changes with the inclusion of the summer diet of the cows fresh grass. Yellow butter in winter give only artificial dyes. Chilled creamy butter must be soft and easily spreadable on a sandwich. Oil crumbles and falls apart? So, the formula of the product was substantially changed. Try to determine the quality of the oil by smell. Not one artificial flavor does not fully recreate the smell of real butter. Natural oil has a clean, without impurities, subtle creamy smell. If the smell through the package, it can be assumed that pack a scented fake. Choosing the oil is loose, examine the slice of the product. Real creamy butter on the structure of dense, dry, slightly shiny. Perhaps the performance of the rare drops of moisture. Often information about the presence of vegetable oils "hide" by using a small font. If you read the composition of the product, it is better to refuse purchase. Adding the prefixes "extra", "special", "traditional", "old Russian" to the name of the oil is likely to indicate a combined product made according to specifications and not according to GOST. Choosing a light sandwich or oil, study the composition. If the product includes more than 50% of the milk, it should be called milk-vegetable mixture, if less than 50%, the vegetable-milk mixture. Fat "Peasant" oil of 72.5%. This oil is made exclusively from natural cream and contains no vegetable additives, no preservatives. It tastes salty, like a real country butter. To mislead the consumer, the manufacturers slightly change the name of the oil: "Peasant" becomes a "Peasant" or "Krestjanskoe". The composition of this oil may contain additives. Present "Vologda butter" has long been considered the best butter in Russia. Before you butter from Vologda, if it meets the following parameters: storage time less than 1 month (after one month of storage the product should be sold as "butter, unsalted"), the fat content of 82.5 %, there is no division into grades, without adding salt. The name "Vologda butter" can be applied only to the product manufactured at the enterprises located on the territory of the Vologda region. Everything else "Vologda butter" is counterfeit. Butter lately has become quite common to imitate. This product is a cream only with a very strong optimism. Unscrupulous manufacturers add a variety of extraneous additives to save on production. To distinguish high-quality natural butter from margarine and product with extraneous additives without any special chemical tests and at home. For starters, you need to carefully read the label on the packaging of the product – if its fat content is more than 60%, the butter actually is. If the fat content is below the stated percent, it means that you have purchased margarine. The spread called product based on vegetable and milk fat, which is a competitor of butter and contains no cholesterol. Also, special attention should be paid to the composition of the product – if it is palm or peanut oil, then you are not butter. In this product should be only animals, not vegetable fats. Important here and the expiration date: if it's too big, the butter definitely contain preservatives and Vice versa, the shorter the shelf life, the less in the product of various chemicals and other additives. 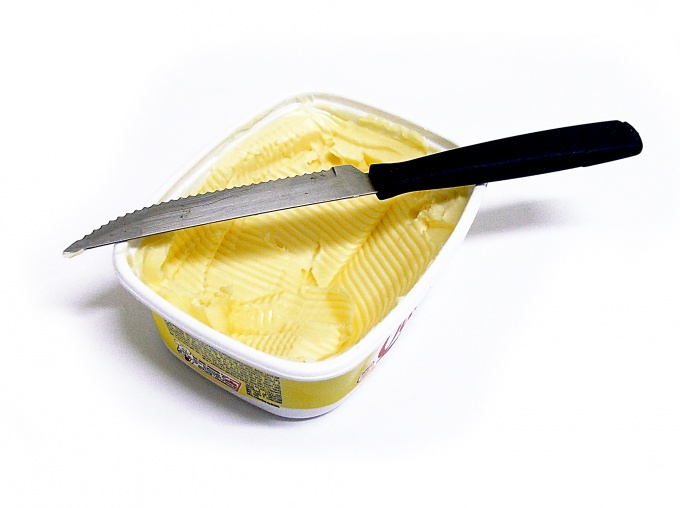 To determine the "authenticity" of butter, cut a slice and leave it for an hour at room temperature. Natural product, will become soft, but not spread out on a plate, retaining its original shape. You can pour a Pat of butter boiling water – it should quickly melt and spread on the water an oily yellowish Islands or droplets. Margarine will continue to swim in boiling water, comprised of small pieces when you try mixing. In addition, a piece of butter can be put in the freezer for three to four hours, then you need to try to cut it with a knife. Natural product without additives will crumble and break away pieces. To determine the presence of chemicals can also use a hot frying pan – quality butter melted evenly, not forming a whitish foam and puddles of water that are normally associated with low-quality vegetable fats. Good oil to the touch should be smooth and solid, and its smooth and brilliant slice should not be split under the knife. 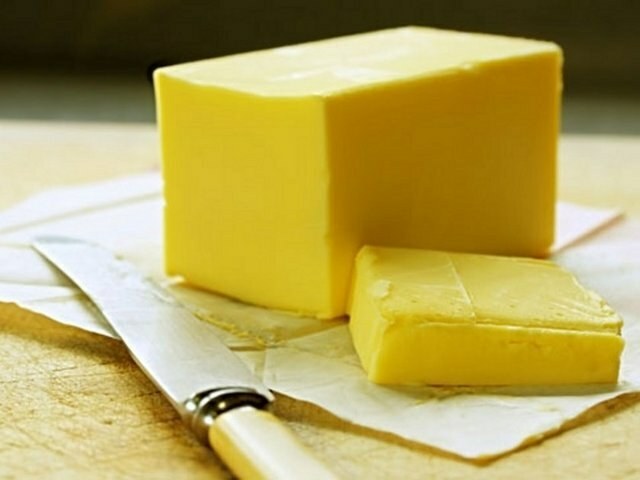 Butter a nice yellow color is composed of chemical dyes, as a natural product is always characterized by pure white color and unobtrusive creamy smell. In addition, this butter has a delicate and mild flavor with no bitterness and other foreign impurities.